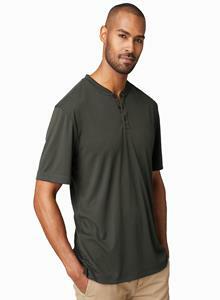 - Prim + Preux Adult 4.4 ounce Energy Henley Top. - Snag resistant, anti-microbial, wicking. - 1x1 rib three button henley. - Side seam with self fabric side vents.Style ships from Jurupa Valley, CA. Prim + Preux Adult 4.4 ounce Energy Henley Top. 4.4 ounce polyester interlock fabric. UPF 30+ excluding white. Snag resistant, anti-microbial, wicking. 1x1 rib three button henley. 3 color-matched buttons. Side seam with self fabric side vents. Sizes: XS-4XL. Colors: White, Black, Legion Blue, Magnet, Navy. Style ships from Jurupa Valley, CA. AVAILABILITY NOT EXPECTED UNTIL MARCH 2019.